A court in Kenya has fined a Chinese man a record 20m shillings (£140,000; $230,000) for smuggling ivory, under tough new anti-poaching laws. Tang Yong Jian was caught last week with an elephant ivory tusk weighing 3.4kg (7.5 pounds) in a suitcase, at Nairobi's international airport. If he is unable to pay the fine, he will spend seven years in prison. Kenya banned trade in ivory in 1989, but there has been a rise in the illegal practice in recent years. There is a huge demand for ivory in Asia for use in ornaments, while conservationists suspect that most of the poached rhino horn is destined for traditional medicine markets in South East Asia, where it is believed to contain powerful healing properties, despite there being no scientific proof of this. In Kenya, a kilogramme of ivory fetches between 12,000 and 18,000 shillings, experts say. 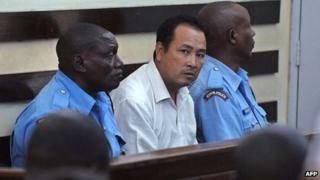 Tang Yong Jian was arrested while in transit from Mozambique to China via Nairobi. He is the first person to be sentenced under the new laws, which came into force in December. The killing of endangered animals now carries penalties of life imprisonment, as well as fines of up to 20m shillings. Previously the most serious wildlife crimes carried a maximum fine of 40,000 shillings and a possible jail term of up to 10 years. A spokesman for the Kenya Wildlife Service, which manages the country's national parks, welcomed the verdict. "It's a landmark ruling that sets a precedent for those involved in smuggling," Paul Udoto told the AFP news agency. He said that poachers had previously been punished with "a slap on the wrist", which had been demoralising for park rangers. A series of other measures have been introduced in recent months to stop the illegal practice, including electronic tracking devices for rhinos and elephants. Wildlife campaigners have also launched a website to name and shame poachers. At least 22,000 elephants were killed illegally in Africa in 2012, according to latest figures.